Combine Atlantic Clipper with Dropbear for the adventure of a lifetime on the East Coast of Australia! Visit Hill Inlet Lookout and take the ultimate selfie! This fun, extended package of Fraser Island in the Whitsundays will show you the time of your life in some of the best parts of Australia. Atlantic Clipper is the largest tour in the Whitsundays and famously known as the most fun, too! This wild ride will keep you entertained every minute of the day, ensuring you walk away with lasting memories and new friends! This trip will be paired with a 3 day tour of Fraser Island that will give you plenty of time to see the island's best assets. For 3 days and 2 nights you will explore Fraser with Dropbear's tag-along tour, even taking the opportunity to drive on the island yourself! This combined package will ensure a fun trip, all while seeing the sights and experiencing the real Australia. Spend your days exploring and your nights partying with the Atlantic Clipper! This tour takes an amazing 53 passengers at a time, meaning you will get to meet plenty of new people while you're exploring this amazing part of the world for the ultimate social tour. You will get to explore the best parts of the Whitsundays, including Whitehaven Beach, Hill Inlet Lookout and the fringing reefs of the Whitsundays. Here you will get to snorkel or even scuba dive for a more in-depth experience! Atlantic Clipper is one of the few boats in the Whitsundays that has an onboard scuba instructor, with both intro divers and certified divers welcome! If you want a memorable trip that is full of lasting memories, plenty of laughs and lots of adventure, Atlantic Clipper is the right tour for you! 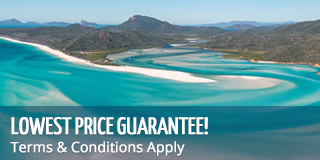 This wild ride has all the added bonuses you could want during your Whitsundays sailing adventure. Dropbears 3 day, 2 night tag along tour is one of the best tours to Fraser Island. The three days will give you plenty of time to explore the best parts of the islands from aboard your own 4 wheel drive vehicle! You are your travel mates will follow your tour guide and lead car around the island, where guests can enjoy the thrill of driving on the world's largest sand island. Combine this with our Wilderness Safari Campsite, and you will be on the adventure of a lifetime. 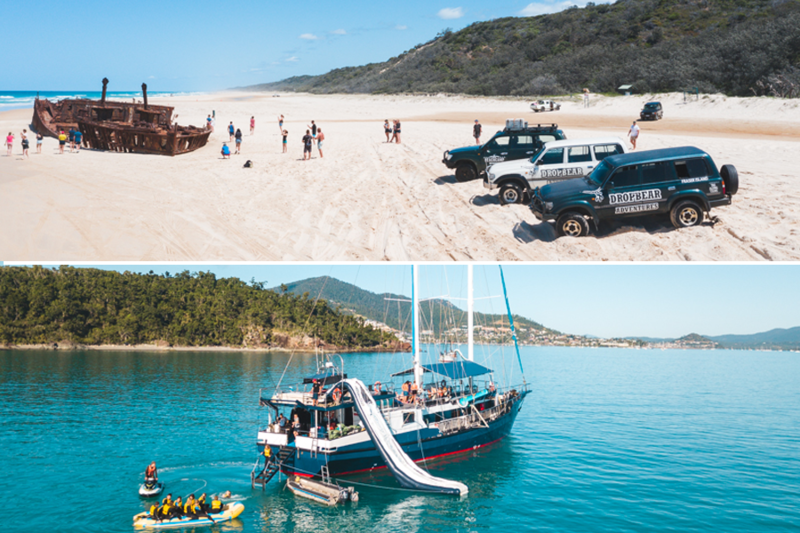 Dropbear Adventures will give you the ultimate Fraser Island experience with all the perks! You will visit all of Fraser Island's top locations and be able to enjoy the full Fraser Island experience. Please note guests must make their own way between Fraser Island and the Whitsundays. Please be sure to allow enough time for travel in between. This package may not be suitable if you have existing neck or back problems or are pregnant. Check with your agent to make sure this tour is suitable for you.